Please note that whilst this guide is primarily aimed at diagnosing Desktop PCs which will not boot or POST, the same sort of steps apply to laptops too. Not every step is going to be relevant to laptops, but some will be relevant. This guide will be updated should I find out anything new or another user suggests changes..
Have you ever tried to turn your PC on before and found that it just won’t start? You get all panicked and start to worry about all that data you have sitting on your hard drive which may have been lost, and you spend forever trying to work out what exactly is the problem, why won’t it work? We’ve all been in this situation before. Well, don’t panic. Sometimes the problem can be as simple as having accidentally switched the power supply off or having accidentally dislodged the power button connector whilst working on the machine, preventing it from starting up. This guide has plenty of ways you can try to troubleshoot a non-POSTING machine. You must make sure you ground yourself before doing anything which involves opening the case and doing work inside. Plug the PC into power, make sure the power is turned OFF at the wall, touch a part of the case that is bare shiny metal (a screw usually works) and then you are done. Try not to move around too much as you will build up charge again. To ground yourself again, just touch the same screw or bare metal part of the chassis you touched before. The earth is always active regardless of power switch on wall or PC. It’s going to be a good idea to have your motherboard manual to hand whilst trying to diagnose. If you do not have a hard copy of the manual, go to your motherboard manufactures’ website and download the manual from there. If you own an OEM system such as a HP, Dell, Acer or any other branded machine, go to the manufacture’s website and download the user guide for the PC. Before we begin, what is a POST? Well POST stands for power-on self-test. The POST tests the computer to make sure all the hardware is running correctly and that it meets the necessary system requirements. Usually, if the POST is successful, the computer will sound one or two short beeps, and will continue to boot, however, if the POST is unsuccessful, you will either hear no beeps at all, or you will hear what is known as a beep code. Beep codes are a series of beeps, some of the beeps longer and shorter than others, which can help you to diagnose why your computer is failing the POST. Find out what those beep codes mean! Let’s begin by finding out which beep codes mean what. It is important for me to stress that all not all beep codes are going to be the same. Consult your motherboard manual if you have it to hand to find out what the beep codes mean, what is written below is a general guide to which each code means. The codes below apply to motherboards which use American Megatrends BIOSes. 2 short…………………..Parity circuit failure, usually related to motherboard or RAM issues. The codes below apply to motherboards which use AWARD BIOSes. The codes below apply to motherboards which use IBM BIOSes. The table of codes below apply to motherboards which use Phoenix BIOSes. Now that we have covered beep codes, we can begin to troubleshoot the problem which is preventing us from passing the POST, or even starting up at all. Here are some suggestions for you to try if your computer will turn out, but produces a beep code telling you why the POST has not been successful. #1 If the beep code indicates that there is a keyboard error, or some sort of error with the keyboard controller, make sure your keyboard is plugged in correctly. If you are using a USB keyboard on an older motherboard, you may need to go into the BIOS and enable USB Keyboard and Mouse Support before you can start using a USB keyboard – older motherboards tend to have this features disabled by default, so you need to enable it. If you cannot get into the BIOS because you have a keyboard error, you’ll need to find an old, working PS/2 keyboard and use that to get into the BIOS. If you are using a PS/2 keyboard and getting the same error, make sure none of the pins are bent on the PS/2 connector. If some are bent, straighten them out using a flathead screwdriver. If you are using a PS/2 keyboard, make sure it is plugged into the correct port. The PURPLE port is for a PS/2 keyboard and that is where you should plug your PS/2 keyboard into. The green port is the for a PS/2 mouse. On some newer motherboards there are may only be one PS/2 port which you can plug either a keyboard or a mouse into. #2 If the beep code indicates that there is something wrong with the CMOS, or a System Time failure, you need to either remove the CMOS battery, or if your motherboard has one, use the Clear CMOS jumper or button (most have a jumper, some of the higher-end boards tend to have a Clear CMOS button) – consult your motherboard manual for instructions on how to do this. #3 If the beep code indicates that you have some sort of video error, make sure your graphics card is working correctly. Take it out and test it in another computer if possible, if not, reseat your graphics card and see if it works then. Also make sure you have connected any additional power cables the card may need. Older AGP graphics cards may require one or two molex connectors to be plugged in to them in order for them to work. Newer PCI Express graphics cards may require one or two PCI Express 6-pin power connectors plugged into them. The higher-end PCI Express graphics cards require 8-pin PCI Express power connectors. Make sure your power supply has the connectors you need, and that the correct cables are plugged into the graphics card(s). Most lower-end cards do not require any additional power. Higher end graphics cards require either two 6-pin power connectors or one 6-pin power and one 8-pin power connector in order to run. 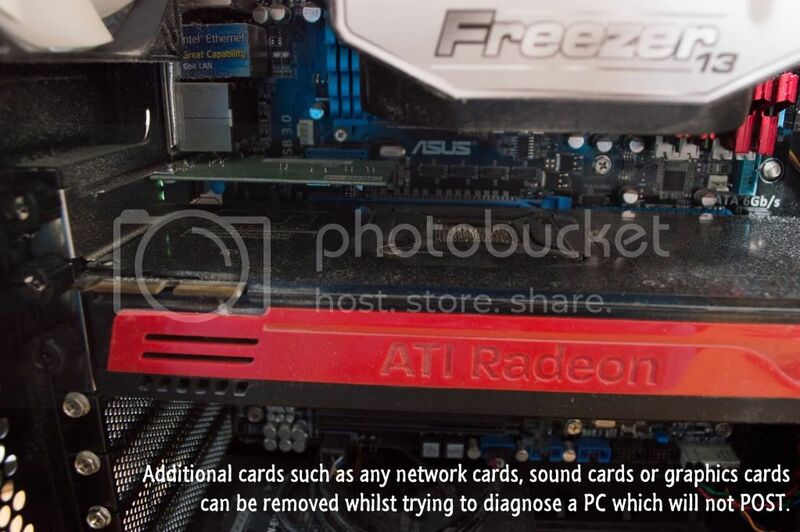 Check your graphics card to make sure you have connected all the appropriately power connectors. It’s best to practise NOT to use molex to PCI Express power connector adapters. If you have a card such as the 5870 or anything else which requires two or more power connectors, get a decent power supply witch already comes with the correct number of power cables. Usually one of the 6-pin power connectors has an extra 2-pins you can add onto the plug to make an 8-pin power connector. If you have a card which requires at least one 8-pin connector, make sure you do this if your PSU does not already have an 8-pin connector. If you have multiple PCI Express slots on your motherboard, move your graphics card into another PCI Express slot and see if it boots OK then. Sometimes the problem can lie in the PCI Express slot on the motherboard itself. If you are using an older PCI graphics card, you can do the same as well. Make sure you have inserted your graphics card into the correct slot on your motherboard. Interfaces are not compatible with one another, ie – installing a PCI Express graphics card into an AGP slot will not work and may damage the graphics card and/or the motherboard. A very common mistake that most novice users make is installing a PCI graphics card into a PCI Express slot and vice-versa. Doing this will not work and you may cause damage. Another way to test your graphics card would be to remove it, plug your monitor cable(s) into the onboard graphics and see if the machine boots successfully using the integrated graphics. If it does, then the graphics card is your problem. However, not all motherboards and CPUs support onboard graphics, so this will only work if both your board and CPU support onboard graphics. #4 If the beep code indicates that you have a RAM error there are several steps you can take. Firstly you can check to make sure that the RAM you have installed is both compatible with your CPU and your motherboard (your motherboard especially). Consult your motherboard manual to find out if your RAM is compatible. A very common mistake to make is installing incompatible DIMMs (a DIMM is another term for a “stick of RAM”), such as attempting to install DDR2 memory into a motherboard which only supports DDR3. This will not work and you will damage the DIMM and the motherboard if you try and do this. If you are building a new system or upgrading an older one, always do your research and make sure that everything you buy is compatible with one another before you buy. Make sure none of the RAM you are using is defective. Start the PC up with all of your RAM installed, if it beeps, turn it off, remove one of your DIMMs, and try again. If it still beeps, continue removing DIMMs until you can get the PC to boot. You can also try swapping the sticks around too, to check if you have any RAM bays on your motherboard. Once you eventually get the PC to at least POST, test your memory. There’s a great free program called Memtest86 which you can download to test your memory for any errors. Download the ISO and then burn the ISO to a CD using software such as Nero Burning ROM, Alcohol 120%, ImgBurn or something of the like, and then boot off the CD and run the test. It will test your memory for any errors. You want to make sure you run the test for a good 8 hours at least to test if there are any errors present. Firstly test with all of your DIMMs installed, if the test fails or even passes remove one of your DIMMs and test again. Keep repeating until you tested each DIMM. You can also make sure that your DIMMs are installed in the correct bays. Consult your motherboard manual to find out if your DIMMs are installed in the correct bay, sometimes if the DIMMs are installed in the wrong bays the computer will not POST. If you are using aftermarket cooling, make sure that your cooler is not making direct contact with any part of your RAM DIMMs as the cooler may be shorting out one or more of your DIMMs, causing a POST failure. Some coolers will not fit properly if all RAM bays on the motherboard are populated. Here are some suggestions for you to try if your computer will not turn on if you press the power switch. You do not have to follow the steps in this order, but you can do if you want. #1 Firstly check to see the motherboard if power by looking for LEDs on the board, they should be on if the PC is plugged into power, even if the PC is not actually running. If no LEDs show when the PC is plugged into power and turned on at the wall on PSU, chances are the motherboard is dead. The colour of the LED varies, but usually it is green, orange, red or yellow. Please note however that older motherboards may not have a power LED on them. A power LED may be present, but the LED may not be on whilst the computer is switched off. 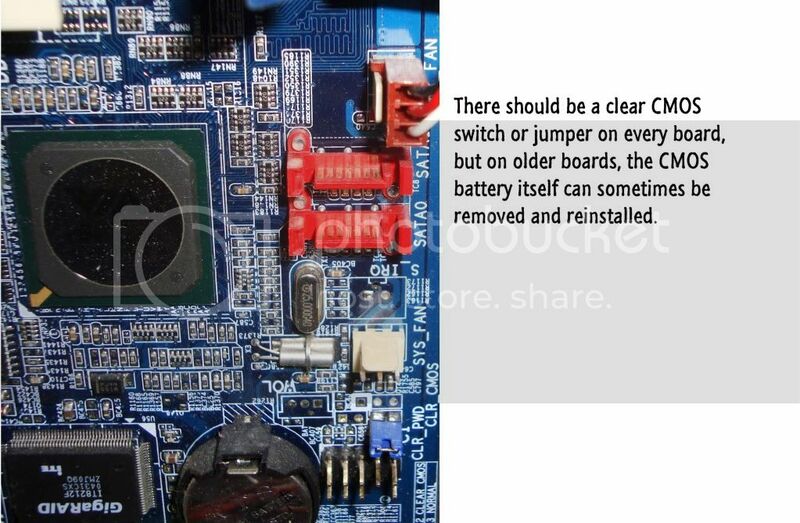 #2 Check to see if the switch on the back of the power supply is switched OFF. If it is, turn it ON, and try to turn on the computer. If the computer does not power on even once you have made sure the switch on the back of the PSU is turned on, the cable could be the problem. Check the fuse to make sure it’s OK, and try using the same power cable in your monitor or on another PC to check if the cable is faulty. Make sure you’ve actually plugged in your power switch into the board! #3 Check to see if you have accidentally dislodged or forgotten to plug in your power switch wires into the motherboard. If you are building a new system and forgot to connect the power button wires, you are a muppet. Plug them in in the correct place (consult your motherboard manual) and see if the PC boots. 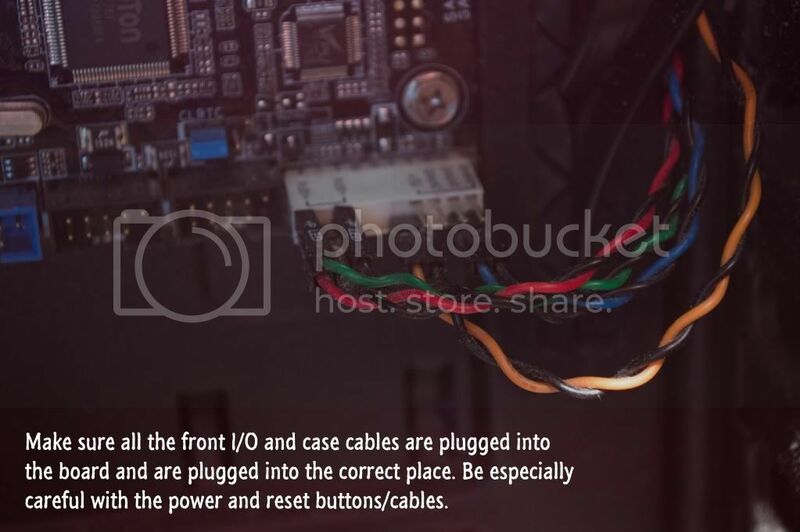 Also make sure you plug the cables into the correct ports on the board, if you plug them into the wrong ports or pins, the PC isn’t going to boot. Usually the location of the ports where the front panel connectors plug into is located towards the bottom right hand corner of the motherboard. #4 Check to make sure everything is plugged in. Check 24-pin (or 20-pin on older motherboards) motherboard power and 4-pin/8-pin (depending on PSU and motherboard) CPU power connector especially. The location of the board power is 99 times out of 100 located on the far right of the board. The location for the CPU power varies, but it is usually around the CPU socket. Also check 6-pin PCI express on graphics card if there is one, or if you are using an older AGP graphics card, make sure you have plugged in a molex connector should your card require one. Sometimes cable management can result in cables becoming dislodged or completely disconnected. If you have done cable management in your case, make sure the cables do not have too much stress exerting on them, otherwise they can come lose and in some cases can prevent the PC from booting. #5 If there is a floppy drive, remove it or unplug it. Often the floppy connector shorts on connecting to the floppy itself, preventing the PC from booting. #6 Start removing or reseating any extra PCI expansion cards such as modems, additional USB cards, sound cards, TV tuners, firewire cards etc etc. Remove one by one and test to see if the PC will boot after you have removed. Eg – remove sound card, see if the PC boots, if it doesn’t, remove modem, see if the PC boots etc etc. You need to do one at the time in order to work out what is preventing the PC from booting. Or you could remove any expansion cards and gradually add them one by one, testing each time., this would be the inverse of the above. #7 Start reseating or removing RAM sticks or try RAM in different combinations/bays. See Step #4 above for details. #8 Remove or reseat any dedicated graphics cards and see if the PC will boot using the onboard video if the motherboard and CPU support it. If not, remove the graphics card, install it temporarily in a known working PC, and see if the PC boots with it installed. If it doesn’t boot with the card installed, there’s your problem. #9 Your motherboard may be shorting out on the case, preventing the PC from booting. This isn’t going to be so much of a problem for those with pre-built OEM machines, but for those who have built their own machines, make sure you installed the correct number of brass stand offs and that the board is not making any contact with the chassis. You want to have the correct number of stand offs, not too many, not too few, in order for the motherboard to work correctly. The motherboard may also be shorting out on the I/O shield, so make sure your I/O shield has been installed correctly. If you think your motherboard shorting on the chassis and/or I/O shield is the problem, remove the motherboard from the case, rest it on a book or other non-static sensitive surface such as an anti-static bag (DO NOT lay it on a carpet) and attempt to boot the PC with the board outside of the case. If it boots, you know that shorting out on the case was the problem. You might also want to check your USB ports. What can happen sometimes with broken USB ports is that two or more of the pins inside the port itself can be touching each other and that can prevent the board from POSTing at all. Check to make sure none of the pins are touching each other and if they are, straightening them out will solve the issue. #10 Try clearing or reseating the CMOS and/or BIOS. In the vast majority of systems, you will just be able to move the Clear CMOS jumper or Clear BIOS jumper in order to clear the CMOS and BIOS, but in some systems you may have to remove the CMOS battery and reinstall it. Consult your motherboard manual for help. Got a bad power supply? #11 Your power supply may have died or it could possibly be on the way out. If you have access to one, try another known working power supply in your system and see if the PC will boot. At first, only connect the essential items such as the motherboard (remember to plug in the 24-pin power cable as well as the 4- or 8-pin CPU power cable), graphics card if you cannot use onboard video, and one hard disk. 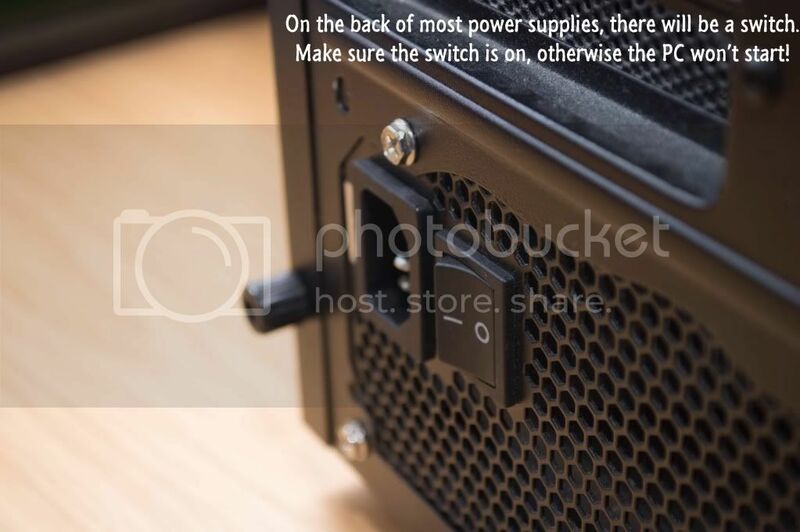 If your PC still will not post with a different power supply, the problem lies somewhere else.